Almost every facebook user is looking for the new dislike button on facebook. Well, no need to wait. You can now DISLIKE, LOVE, DESTROY, HATE or even DISAGREE with one of your friends status message. Cool eh? 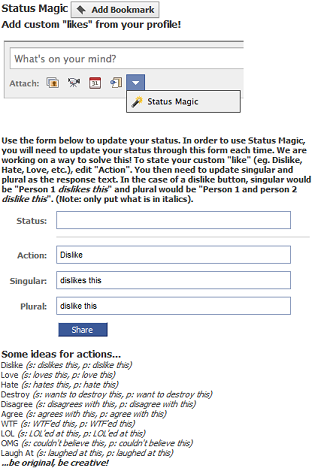 Just click Status Magic and you will see a form where you can update your status message. Play around with your facebook status so that you will not get easily bored. No need for you to like many fanpages that claim they are really working if you suggest them to your friends and copy the code, the dislike button will appear to your homepage. A total NO. See? It’s really cool. Haha! Try it.